Bah�'� Temple is known as one of the most beautiful architectural temples in India. 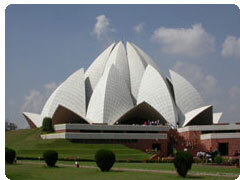 Popularly called Lotus Temple as it is built in the shape of a Lotus flower and reaches a height of more than 40m. It was completed in 1986 and one can enjoy its exquisite beauty even from a kilometre distance, at night. This grand temple is termed by many as the Taj of modern India. It belongs to the Bah�'� sect and is now a significant landmark of Delhi. The structure is made of pure white marble in the shape of a half-opened lotus and is surrounded by delicately manicured lawns. This architectural wonder is made of a combination of marble, cement, sand and dolomite. One can see 27 giant white petals of marble in a lotus shape, springing from nine pools and walkways indicative of the nine unifying spiritual paths of the Bah�'� faith. People of any faith can enter this temple to offer their prayers. The Bah�'� House of Worship is dedicated to the oneness of all religions and mankind. 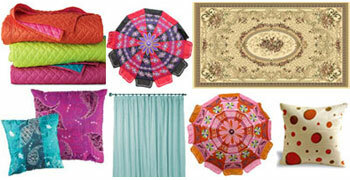 Its doors are open to people of all faiths, races and cultural backgrounds. Subsidiary buildings that afford relief to the suffering, sustenance to the poor, shelter to the traveller, solace to the deprived and education to the ignorant will abound around the House of Worship. There are no clergymen in the Bah�'� Faith and its service consists of prayers and readings of selections from Bah�'� scriptures.The Bah�'� religion is an independent one and not a sect of any other religion's manifestion. The Bah�'�s lay great emphasis on prayer and meditation. These, they believe are important instruments for the progress of the human soul, both in this world and the next. The Baha'i`is pray to one God, the Creator of the Universe. The act of praying is described as 'Conversation with God' and meditation is perceived as the 'Key for opening the doors of mysteries'. In that state, man withdraws himself from all outside objects and immerses himself in the ocean of spiritual life. In the Bah�'� Holy Writings, there are prayers for all occasions and can be offered individually or collectively. A great importance is given to prayers as it is revealed in all the Scriptures. But the Bah�'� Writings specify that the mere act of praying is not sufficient. The inspiration drawn from one's prayers must be translated into action that promotes the well-being of humanity. The temple represents the Bah�'� faith, which is broad in its outlook, scientific in the influence it exerts on the hearts and minds of men. It signifies the purity and the universality of the lord and equality of all religions. Visited by over four million people, annually, this gleaming lotus-like marble structure is located on Bahapur Hills and it is the seventh and most recent Bah�'� houses of worship in the world. The temple is a must visit for every tourist who comes to Delhi. Photography / Videogrpahy: Both Still camera and movie camera are allowed in open area of campus, but not allowed in covered area.